A violinist and composer, Kevin Moore is the music editor of www.TIMBA.com and served as a consultant for articles and features produced by the BBC, the Los Angeles Times, and musicologists from Harvard University. Kevin Moore is the co-founder and music editor for the world’s largest Cuban music website, www.TIMBA.com, to which he has contributed the free, online multimedia book The Roots of Timba, dozens of book-length articles, discographies, record analyses, interviews and the daily Cuban music blog La Última, which is nearing its 10th year of publication. As musical director, composer, arranger and violinist of the California-based salsa band Orquesta Gitano he co-produced the 1998 CD Salsa Gitana. Latin Pulse Music wants to thank Kevin Moore for his outstanding achievements in the field of Caribbean musicology. Around the world there are many who caught the timba "bug" because of him. The Oru Seco play-along set with complete 48 page transcription we are offering exists only because of his relentless drive to understand what constitutes truly great music. In the early 2000s Kevin co-wrote The Tomás Cruz Conga Method, Volumes 1-3, a critically acclaimed method book used as a text at various educational institutions. These method books are published by Mel Bay and available for purchase on www.amazon.com. 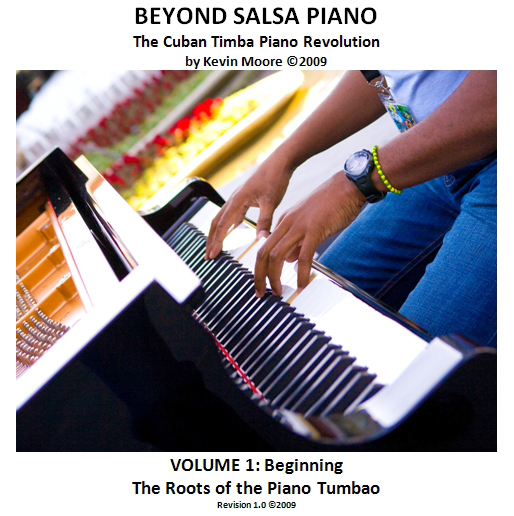 Written by the editor of the world’s largest Cuban music website, www.TIMBA.com, and the author of the popular “Tomás Cruz Conga Method”, Beyond Salsa Piano is a series of method books and historical/discographical guides chronicling the role of the piano in Cuban music. Volume 1, with a "beginning" difficulty level, covers the earliest antecedents of the piano tumbao and provide exercises for beginning pianists to develop the technique necessary to play salsa and timba piano tumbaos. It begins with piano adaptations of tres guajeos from the seminal folkloric genre of changüí, which predates the first Cuban recordings, and then proceeds to the danzón and son genres of the 1900-1940 period to look for early roots of the modern piano tumbao in the tres and violin parts. The volume concludes with an extensive study of the various types of tumbaos pioneered by Arsenio Rodríguez in the 1940s.